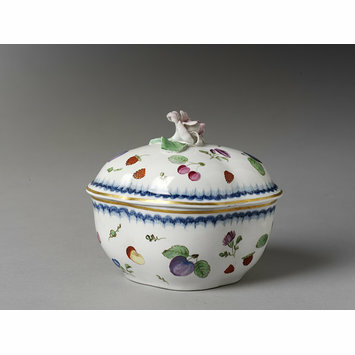 Sugar bowl and cover of hard-paste tin-glaze porcelain painted with enamels and gilded. Decorated with cherries, strawberries, flowers and fruit. Borders with a band of blue feathery painting under the glaze and with a gilt band. 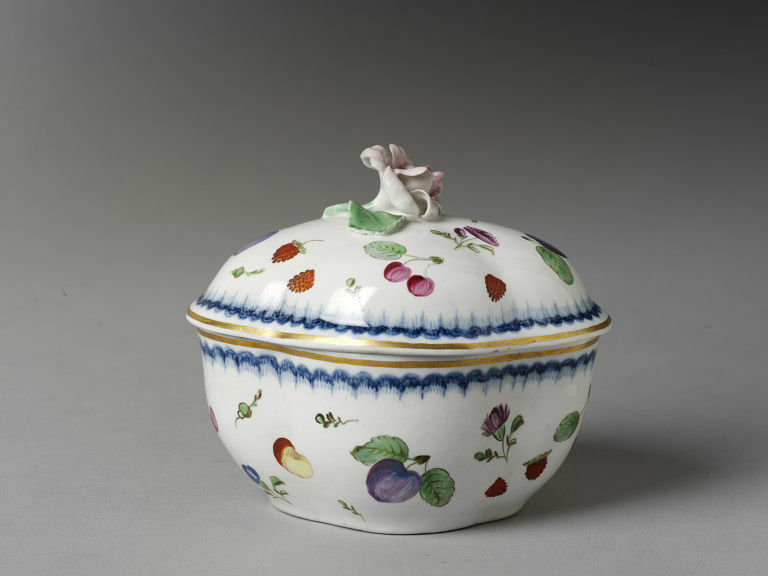 Sugar bowl and cover of hard-paste porcelain, Doccia porcelain factory, Doccia, ca. 1790-1800.
gift: Marquis Leonardo Ginori Lisci in memory of Arthur Lane A four-lobed sugar bowl decorated “a frutta e fiori sparsi” (scattered fruit and flowers) painted in colours and gold. The knob of the cover is in the shape of a flower. This type of decoration was typical of Ginori and was used on complete tea and coffee sets and dinner services from the last quarter of the 18th century to the first quarter of the 19th century. The term “scattered fruit and flowers” was first used in an inventory dated 1780 (AGL, I, 2, f. 37, Fabbrica delle Porcellane di Doccia. Scritture e Documenti, fasc. 20). It is particularly interesting to note that the sugar bowl was given to the museum by Marquis Leonardo Ginori Lisci in memory of Arthur Lane.